It's What's Up Front That Counts! - Veterinary Management Consultation | VMC, Inc. This nationally acclaimed seminar is considered “basic training” for anyone working in a veterinary hospital. Do you know how clients determine your practices perception of value? In what period of time is this determination made? You might think you are doing a great job in your practice, but what do your clients think. 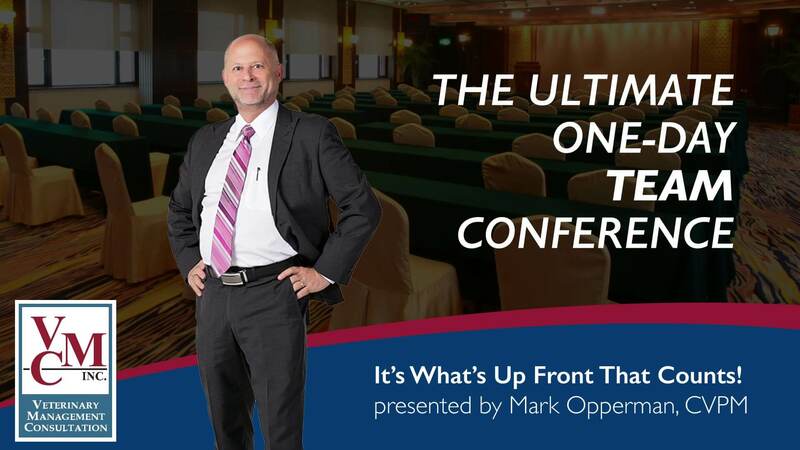 This one day action filled seminar takes a look at your practice from your client's point of view. We will start with online reviews and move our way into the hospital, what does the outside physical environment of your practice say about your practice? How are clients greeted when they first enter your reception area? What happens in the exam room and more importantly what can we do to improve upon this process? Price is only an issue in the absence of value! If clients are complaining about price, it most likely is not the price, but they fail to see the value of your services. Learn how to educate clients about the value of your services and enhance your profitability and client satisfaction. 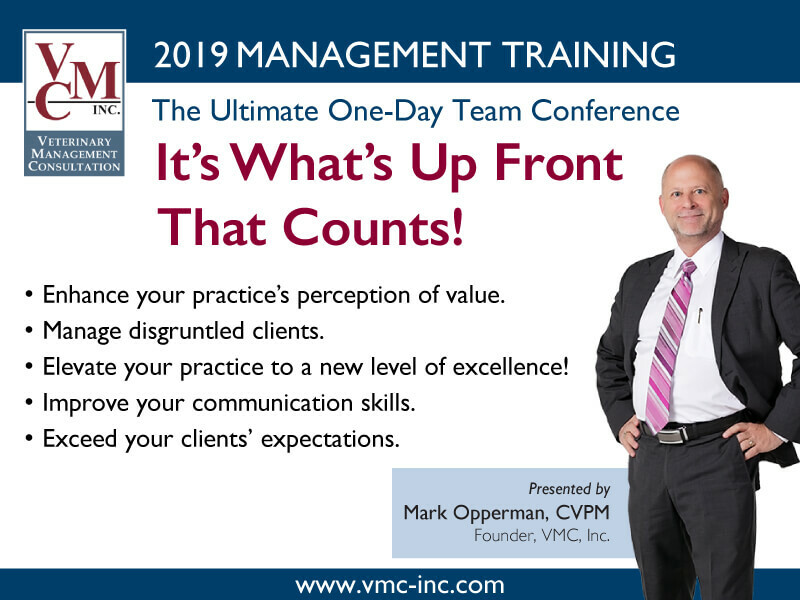 Mark Opperman will share with you his years of practical experience to teach you how to improve upon your bonding rate and enhance the customer service provided by the practice. You will walk away with a customized suggestion list on what you can do to improve upon your practice. Communication is the key to success, so we are going to talk about verbal, non-verbal and written communication. This information is applied to the veterinary environment, learn what clients want and how we can effectively communicate to them. Have conflict with clients, want to know how to resolve it, or turn that upset client into a happy client? During this day long seminar you will receive some great examples of written communication and some forms that will help you practice smarter, not harder. To achieve maximum benefit, this seminar is intended for the entire health care team. It is suggested that all doctors, practice managers, receptionists, technicians, and assistants attend the meeting. Those attending will return from this seminar with a unified goal, motivated to enhance your practice’s teamwork and productivity. Tuition Fee: The tuition fee is $225 per person and $180 per person for groups of 5 or more. This group rate cannot be combined with other discounts. Registration is limited and advance registration is required. The fee includes all workbook materials, seminar instruction and refreshment breaks. Please note that the registration fee does not include lunch or parking expenses. Registration Confirmation: Within 10 business days of registration, all registrants will receive a confirmation and receipt with specific event details. Transfer your registration to another seminar of your choice within 24 months. If you fail to attend without advance notice, your tuition will be forfeit. Daily Schedule: Seminars are held from 9:00 am to 4:00 pm. Registration and continental breakfast begin at 8:00 am. Due to the volume of material to be covered, the seminar will start promptly at 9:00 am. Hotel Information: Please contact the hotel directly for specific location information and/or directions. Hotel contact information will be provided on your confirmation receipt. This course meets the requirements for 5.5 hours of continuing education credit for Veterinarians and Veterinary Technicians in jurisdictions which recognize AAVSB's RACE approval. Participants should be aware that some boards have limitations on the number of hours accepted in certain categories and/or restrictions on certain methods of delivery of continuing education. (AAVSB RACE Provider No. 177). "Very informative, very encouraging/challenging. Makes you take a good 'look' at yourself and clinic. Mr. Opperman…is a great speaker - very dynamic and interesting." "As a new practice owner it is hard to recognize problems and find solutions - my team is going home ready to implement change." ‍Reserve room by 4/5/19 to obtain VMC Room Rate of $179. ‍Reserve room by 4/26/19 to obtain VMC Room Rate of $187.